As part of the Music Awards’ year-round programming, the AMAs are thrilled to announce a partnership with the Circuit of The Americas — sponsor of the Margaret Moser Women in Music Award — who will invite winners and nominees to perform at events hosted by the world-class sports and entertainment venue. 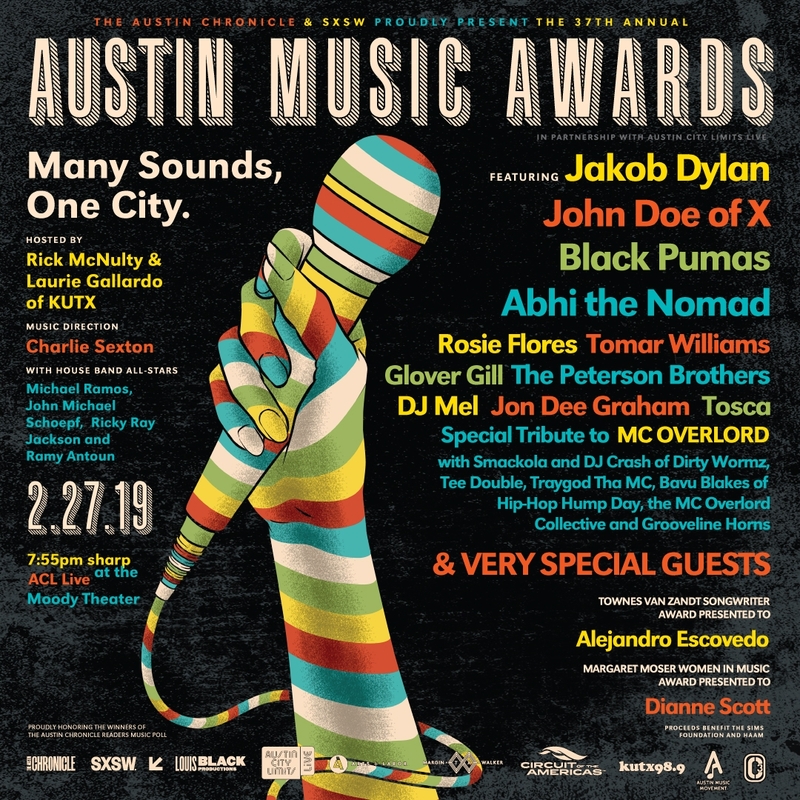 The Austin Chronicle, SXSW, and Austin City Limits Live at the Moody Theater are proud to announce the performance lineup for the 37th annual Austin Music Awards (AMAs) taking place on Wednesday, February 27, 2019, with proceeds benefiting the SIMS Foundation and HAAM. Tickets for the event are available now at acl-live.com and austinmusicawards.org. Without fail, legendary performers, guests, and presenters like Robert Plant, Fiona Apple, Chrissie Hynde, Fab 5 Freddy, Terry Allen, Blondie, Bruce Springsteen, and Pete Townshend have all taken the stage at the Austin Music Awards. For 36 years, the event has celebrated the Austin musicianship that the city is known for the world over. This year’s roster follows suit, featuring genre-spanning talent that includes singer-songwriter Jakob Dylan, Bob Dylan’s son most known for his years as frontman for rock band The Wallflowers; John Doe, co-founder of LA punk band X, whose musical compositions span rock, punk, country, and folk; buzzworthy Austin-based psychedelic soul outfit Black Pumas; Tomar Williams from soul group Tomar & the FC’s; rockabilly and country music artist Rosie Flores; the foremost provocateur of tango in Austin, Glover Gill, of Glovertango; Jon Dee Graham, former member of the True Believers with Alejandro Escovedo and three-time Austin Music Hall of Fame inductee; Tosca, the tango orchestra comprised of various Austin-based musicians; Austin’s youthful soul, funk, blues, and jazz outfit The Peterson Brothers; India-born, Austin-based rapper Abhi the Nomad on the cusp of releasing his debut album, Marbled; and the renowned DJ Mel, recognized as “Obama’s DJ” after performing at the 57th Presidential Inauguration. Additionally, there will be a tribute to the late MC Overlord, known as Austin’s hip-hop pioneer. Donnell Robison, aka MC Overlord, was the recipient of nine Austin Music Awards throughout his career and passed away in 2018 at age 49. His legacy will be honored at this year’s event via a special tribute by Smackola and DJ Crash of Dirty Wormz, Tee Double, Traygod Tha MC, Bavu Blakesof Hip-Hop Hump Day, the MC Overlord Collective, and Grooveline Horns. The AMAs will announce a special guest performance day of. To honor the continued success and significance of this annual event and further solidify its importance in this community, the City of Austin has proclaimed February 27 as Austin Music Awards Day. "What has always truly and uniquely defined the Austin music scene is the work those in it put in. More than critics, industry honchos, scene makers, or even music fans, so many musicians work so hard in this extraordinary community to impress the audience they regard as the most important — other musicians," said Louis Black, co-founder of The Austin Chronicle, SXSW, and the Austin Music Awards. "Once a year, the community comes together to honor our own at the Austin Music Awards and to honor the winners of The Austin Chronicle Music Poll. It is a great night, a true gathering of talent, a reunion and homecoming, and a celebration. And then, because of who we are and what we do, we get up the next morning and get back to work." The Austin Music Awards will celebrate the winners from The Austin Chronicle Music Poll, managed by the locally owned and operated alternative newsweekly that reflects the heart and soul of Austin, Texas. The awards will reveal the winners for 52 different categories, including winners of “Best of the Year” categories for Austin band, musician, song, album, and best new band. Other winners include “Best Performing Band” in a variety of genres and “Best Austin Musician” selections, including the categories of female and male vocalist, guitar player, bass player, keyboards, strings, horns, other instrument, and the “Songwriter of the Year” award. The Townes Van Zandt Songwriting Award, which honors a talent whose work has had an extensive and ongoing impact in Texas, the U.S., and around the world, will be presented to singer-songwriter Alejandro Escovedo at this year’s awards by Austin’s own Britt Daniel. The Margaret Moser Women in Music Award, awarded to women in the industry with deep roots who are living legends of our time, will be presented to long-time music champion Dianne Scott by Texas legend Steve Wertheimer. Charlie Sexton will serve as music director for the 2019 awards, joining the Mayor’s House Band that includes Michael Ramos, John Michael Schoepf, Ricky Ray Jackson, and Ramy Antoun. Rick McNulty and Laurie Gallardo of KUTX will also return to host the awards ceremony. In addition to the Austin Music Awards, the Austin Music Industry Awards (AMIA), a special celebration honoring winners of the industry-specific categories from The Austin Chronicle Music Poll, will take place on Sunday, February 17, 2019, at Emo’s Austin. The awards are pleased to recognize two nonprofit partners: the SIMS Foundation and the Health Alliance for Austin Musicians (HAAM), two organizations offering services and support to Austin’s live music industry. Together, they work to “Heal the Music” and maintain a vibrant and healthy industry for all. Stay tuned to The Austin Chronicle for additional news about this year’s event, and expect surprises as our community celebrates 37 years of the Austin Music Awards. The Austin Music Awards are presented by The Austin Chronicle, SXSW, and are produced in partnership with Louis Black Productions, ACL Live at the Moody Theater, and Margin Walker. As part of the Music Awards’ year-round programming, the AMAs are thrilled to announce a partnership with the Circuit of The Americas — sponsor of the Margaret Moser Women in Music Award — who will invite winners and nominees to perform at events hosted by the world-class sports and entertainment venue. The awards are also excited to highlight their partnership with the Hotel Van Zandt, sponsor of the Townes Van Zandt Songwriter Award, who will be teaming with The Recording Academy in 2019 to recognize the essential roles held by women across multiple segments of Austin’s live music industry. 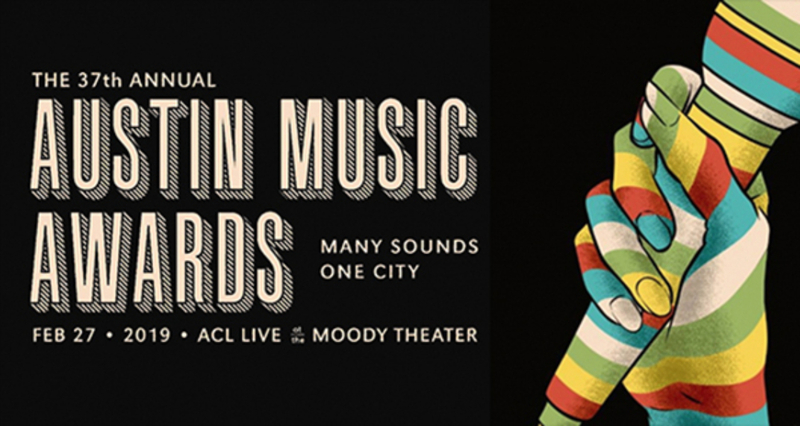 Additional patrons of the Austin Music Awards include the Austin Music Movement, Creative Action, Prosperity Bank, C3, Skull Island Studios, YETI, Tito’s Vodka, Lyft, the Clifford Antone Foundation, Treaty Oak Distilling, Hotel San Jose, Arts+Labor, and Yep Roc Records. The AMAs would like to thank all of our incredible community partners who help make this event possible. Contributions to the Austin Music Awards can be made through the 501(C)(3) the Society for the Preservation of Texas Music and are tax deductible. For more event updates, visit austinmusicawards.org.